We have two family run guest houses of different standards offering accomodation to interested guests. CLEAN. QUIET. FRIENDLY. FAMILY RUN. LUSH GREEN GARDENS, PERFECT TO SIT OUT AND ENJOY YOUR HOLIDAY. EXCELLENT RESTAURANT IN THE GARDEN. A WEALTH OF VERY HELPFUL AND HONEST TOURIST INFORMATION. THE CLEANEST GREENEST TREKS AVAILABLE. LOCATED IN THE HEART OF THE CITY - EASY WALKING DISTANCE TO ALL MAJOR SITES INCLUDING THE NIGHT BAZAAR. CLOSE TO TEMPLES, POST OFFICE, BANKS, SWIMMING POOLS, CRAFT SHOPS, BOOKSHOPS. Eagle House has been run by the same family for 30 years. 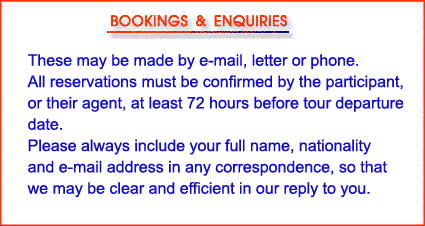 Accommodation is simple, there is a choice of fan, or aircon, cooled rooms. All rooms have a private shower and toilet facilities. Towels and all bedding is provided. Eagle House is close to a beautiful 600 year old stupa, you will enjoy relaxing in our quiet, lush, tropical garden. An all day clean, wholesome, inexpensive breakfast is available at our restaurant. We also serve delicious Thai, Western and Vegetarian foods available from 7am, we are happy to cater to special diets. Where possible we prepare dishes using organic fruit and vegetables and we also like to support the small farmer, or community co-operative, rather than the corporation. The farmer delivers to us directly without bypassing a middle man, this is the case for most of our fruit, vegetables, organic coffee beans and organic honey. Especially delicious is our homemade natural yoghurt, hand-churned butter and cheese all guaranteed preservative and colour free. We do NOT serve frozen, or microwaved food. Everything is fresh, fresh! At Eagle House we provide all the services a visitor would wish to avail of, honest information � Eagle House trekking, Eagle House sightseeing, The Chilli Club Cooking Academy Thai cooking courses, air tickets, hotel bookings, visas etc. We sell stamps and postcards. There is a book exchange and board games to play. There is a library of books on Thai culture, customs, environment and more. Eagle House is renowned for its environmentally friendly and culturally sensitive treks to remote areas where there are no other tourists. The owner is Annette (Thai-Irish) who has been running treks and sightseeing tours for thirty years and wishes to share her love and respect for Thai and Hilltribe cultures with all visitors to the exotic North! 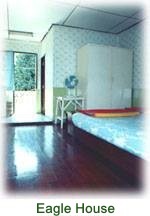 If you would like us to recommend you another hotel or guest house in Chiang Mai, we will happily do so. An air conditioned room at a large guest house with a pool costs from B800, at a better hotel from B3,200 the choice is enormous, better and more expensive (B80,000 per night), up to you. and your travels around thailand! Map of location and address in Thai.